PARIS -- Renault is considering adding two upscale brands and further expanding in emerging markets to decrease the automaker's reliance on Europe's shrinking volume car market, Chief Operating Officer Carlos Tavares said. The automaker may revive the Alpine marque to offer sports cars and create another high-end brand to sell luxury models, Tavares said in an interview with Bloomberg. "You need to be competitive across the world," Tavares said. "That's why we have been managing the change from a European-focused company toward a global carmaker," he said. Under the plan, Renault would have four brands in total, with the Romania-based Dacia selling no-frills autos, Renault offering volume cars with more options, Alpine serving as the sports-car make and the Initiale Paris insignia becoming the luxury brand. With no high-end marques currently, Renault's most expensive car is the large minivan Espace, which has a base price of 35,100 euros ($44,340). As a comparison, the flagship A8 sedan from Volkswagen luxury unit Audi starts at 78,780 euros. In February, Tavares said Renault is in the early stages of developing an upscale car based on a Mercedes E class platform, which would extend a partnership formed by the French carmaker and Mercedes parent Daimler in 2010 to pool development and production of small cars and engines. Last month, French newspaper Les Echos said Renault will make a decision on the Initial Paris and Alpine sub brands by the end of the year. Tavares' ambition to create two new units comes as Renault faces slumping sales in western Europe, where the automaker earned about 65 percent of 2011 revenue. The region's car deliveries will shrink 7 percent in 2012, the fifth straight annual decline, as consumers hold back spending over concerns the sovereign debt crisis will spread, industry association ACEA said this month. Deliveries of Volkswagen Group vehicles in the region fell just 1.9 percent through May, buoyed by sales of Audi, which gained 4.2 percent. VW Group's European market share climbed to 24.1 percent from 22.8 percent. Audi accounted for 44 percent of the Germany-based carmaker's first-quarter operating profit even though it delivered just 15 percent of the group's vehicles. A similar brand could be central to Renault's plans to expand outside Europe, particularly in vital markets such as China. "We may have one day a luxury brand," Tavares said. "That would help from a profitability standpoint because everybody's always looking at VW and what Audi represents for the VW group." Mike Tyndall, a Barclays analyst in London, said: "All eyes in Europe are on VW, wondering how to compete against the number one player. So the question for Renault would be: can an upscale offering be credible?" Renault is talking to potential partners to help revive the Alpine brand and share in the development costs, Tavares said, without providing additional details. 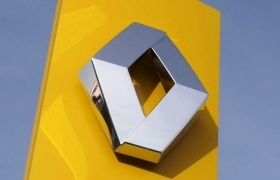 Renault currently has two main alliances with Nissan and Daimler. Alpine was founded in the 1950s and became well-known among sports-car enthusiasts for the A110 and Berlinette, which was introduced in 1962. In the mid-1960's Alpine signed a partnership with Renault and its cars were distributed through Renault dealers. A decade later, Renault bought a majority of Alpine before shutting down production of the brand in the 1990s. "Having a sports car brand such as Alpine would represent a real strategic shift," said Carlos da Silva, an analyst at IHS Automotive in Paris. "Renault considered that option to be much too costly up to now." Tavares points to Nissan's development of the Infiniti brand as a possible model for what he's considering for a Renault luxury marque. Infiniti originally started in 1989 in the United States as a Nissan offshoot before evolving over a 20-year period into a full-fledged luxury brand of its own. Renault may do something similar with the Initiale Paris label, which is currently used on special edition versions of the brand's models, Tavares said. Renault's five-month deliveries worldwide fell 5.7 percent to 1.07 million vehicles, according to the carmaker's Web site. The automaker's European market share during that period dropped to 8.3 percent from 9.6 percent, according to ACEA data. The carmaker, which hasn't reported any profit figures for 2012 yet, posted a 0.7 percent decline last year in earnings before interest and taxes to 1.09 billion euros. Tavares, 53, is working to remake Renault one year after replacing Patrick Pelata, who stepped down following a botched espionage investigation that led to the wrongful dismissal of three senior managers. The Portuguese executive joined Renault 31 years ago as a test-driving engineer and held several executive positions, most recently as head of Nissan's operations in the Americas. Renault owns 43.4 percent of Nissan. As well as extending its brands, Renault also plans to push expansion outside Europe in emerging markets, Tavares said. The Renault-Nissan alliance targets raising its Russian market share to 40 percent by 2015 from 33 percent following the takeover of Lada maker AvtoVAZ. Russia is forecast to surpass Germany as the largest auto market in Europe in 2014. The French carmaker has signed a tentative agreement with Dongfeng Motor Group Co. to start producing cars in China, the world's biggest auto market, by the end of 2015. Renault is also in negotiations with the Algerian government to build a factory in the country to expand in North Africa. "You'll be surprised in a few years to see the market share that we have in some regions outside Europe," Tavares said. "The ambition we have in Europe is to make sure that you, as a consumer, will hesitate between a Volkswagen and a Renault."